Ben was born on August 15, 1972. At the age of eight, he got his first acting job on the PBS series "The Voyage of the Mimi". At that time, Ben met Matt Damon and both became best friends. Together, they attended classes at the Cambridge Rindge and Latin School and were part of a group that won a Boston Globe drama award. Both of them appeared in movies filmed in Boston and after graduation, they appeared as extras in some films. Matt went on to study at Harvard while Ben was more on to pursuing a career in acting rather than working hard to earn an academic degree. Ben entered the University of Vermont and California's Occidental College and worked hard but the entertainment world was so alluring for him to ignore. he acting bug must run in the family, as younger brother Casey is also now an actor. He worked in the mini-series "Hands of a Stranger" and "Daddy". After some hard work, Ben made his feature film debut in "School Ties" with his friend Matt Damon and with Chris O'Donnell and Brendan Fraser. Ben also appeared in Dazed and Confused that also featured Milla Jovovich, Matthew Mc Conaughey and Parker Posey. He also made an HBO Telefilm "A Body to 190 Die for: The Aaron Henry Story". He wrote and directed a short film entitled "I Murdered My Lesbian Wife, Hung Her on a Meat Hook and now I've got a Three-Picture Deal With Disney" that made film distributors fight for the rights to release the film. Ben also appeared in Mark Pellington's "Going all the way" and "Mallrats" where he was a manager of a men's store 932 in the mall. After some tough writing and movie appearances, Ben and Matt decided to make a movie to call their own. Goodwill Hunting was the result of all their hard work and determination that led them to their success in life. Their movie, Goodwill Hunting, earned them a Golden Globe award and an Academy award. After Goodwill Hunting, both actors went on their own to continue their success as an entertainer. 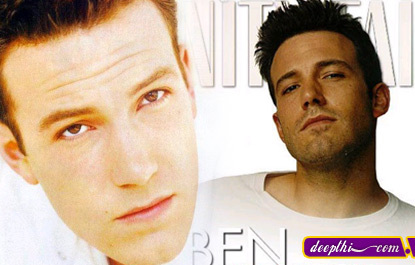 Each of them appeared on one of the biggest movies of 1998, Ben in "Armageddon" and Matt in "Saving Private Ryan". Dogma, a religious ridicule, will re-group the twosome. Ben is also teaming up with Sandra Bulock in the film "Forces of Nature" and he is doing a movie with Courtney Love, Christina Ricci and his brother Casey in the movie "200 cigarettes". Ben is set to do a movie with his "sweetheart", Gwyneth Paltrow in the movie Shakespeare in Love.